Oyster Card Holders can be utilised to hold not only the Oyster™ card itself, but other travel cards, train and bus tickets, credit debit and business cards! Personalised with a custom print of your company brand name and logo, your customers will notice the double-side print and remember who you are. Choose from a range of colours and hand out as a business gift or company freebie! With over 34 million Oyster™ cards issued since 2008, why not have customers hold them inside your Oyster Card Holders given to them as a free company gift? 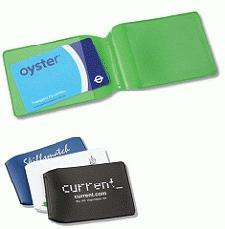 For a FREE QUOTE, please fill in the form regarding our Oyster Card Holders and we'll be able to help you.